But a contrast might illuminate something. 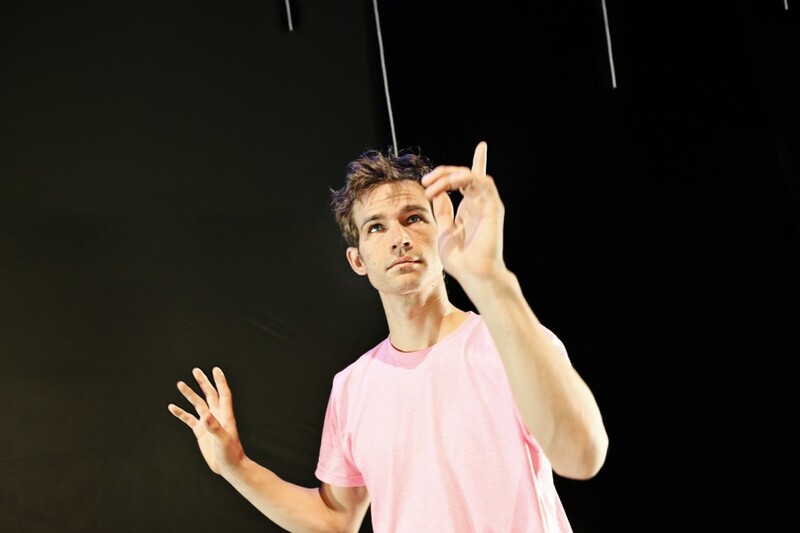 The other piece on Outlet’s double bill was a solo in which BodyCartography’s Otto Ramstad gave the audience not so much something to see as something to witness—a transformation, an embodiment, that we take in with our whole social and physical being. The benefit of writing a blog is that I can that I can write about things that are happening right now. The downside, of course, to writing a blog for a hotel, and so knowing that of the very few people who will read this, an even smaller number will actually be in town, is that telling you about things that are happening right now might only be frustrating for everyone. 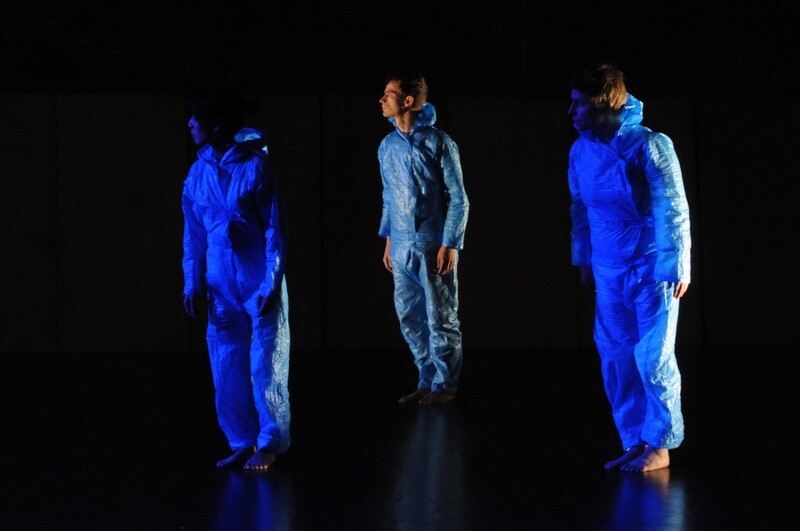 Twin Cities dance troupe explores human behavior and the psyche in a bold, smart world premiere. You might worry about a show that first requires you to avoid running over a performer darting about the cavernous Walker Art Center parking ramp. It’s like he broke loose from his pack. 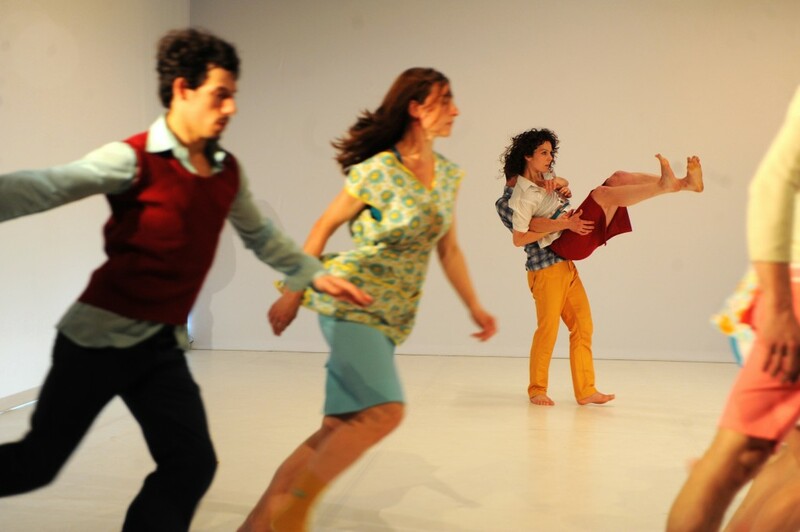 But that’s the sort of unexpected wildness that defines “Super Nature,” a sneaky-smart world premiere conceived and directed by Olive Bieringa and Otto Ramstad of Minneapolis-based BodyCartography Project, with music by Zeena Parkins. To spark discussion, the Walker invites local artists and critics to write overnight reviews of ourperformances. The ongoing Re:View series shares a diverse array of independent voices andopinions; it doesn’t reflect the views or opinions of the Walker or its curators. Today, PenelopeFreeh shares her perspective on Thursday night’s performance of Super Nature by theBodyCartography Project with Zeena Parkins. When I talked to Olive Bieringa and Otto Ramstad about their performance installation at the Walker Art Center, they told me the basics but kept the details a secret. The duo that makes up the BodyCartography project would only divulge that the installation was an experiment for their upcoming “Super Nature” show, and that the performance would involve a ten-minute, one-on-one interaction between a performer and an audience member in an empty gallery. 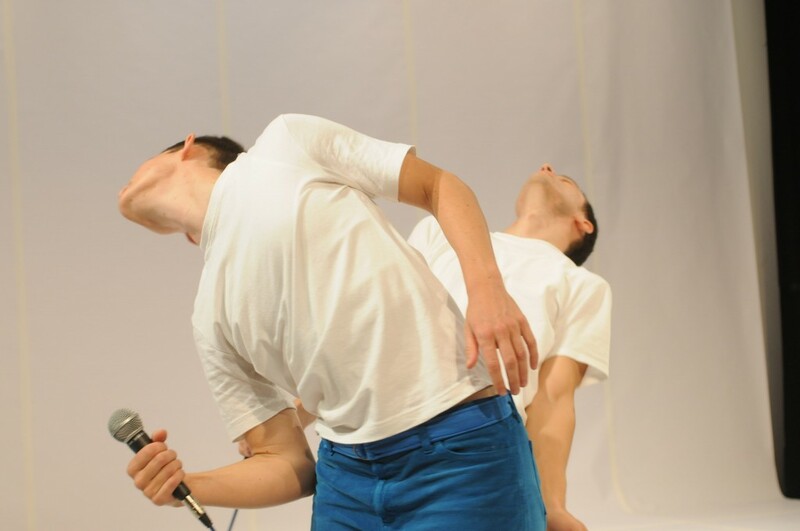 The BodyCartography project wants to experiment on you at the Walker this weekend. 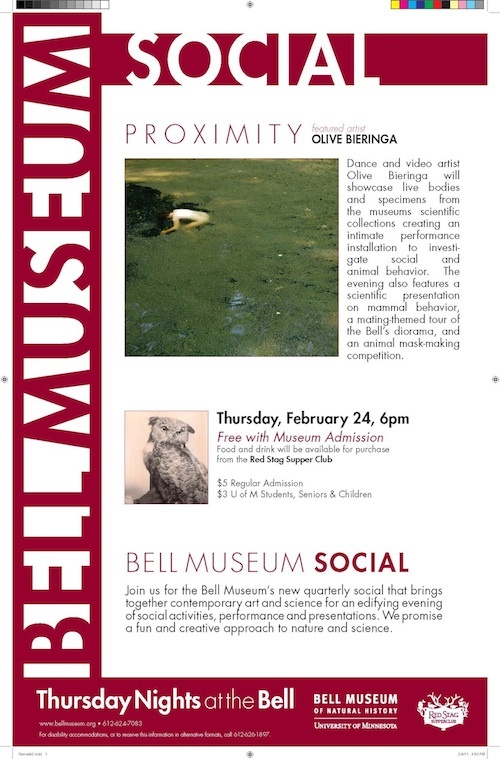 Science meets art on Thursday for a unique installation at the Bell Museum led by choreographer Olive Bieringa ofBodyCartography Project. Part of an artist-in-residence program at the museum, Bieringa has spent the last month talking to scientists and developing an installation called Proximity that explores social boundaries, personal space, and animal behavior. Olive Bieringa doesn’t pull her punches when it comes to the local audience. “People in Minnesota are nice, but I think there is a little anxiety about proximity and intimacy,” she says. Bieringa, (shown here in a previous work) is co-director of the Body Cartography Project will be looking to pokeat some of those anxieties with an evening called “Proximity” at the Bell Museum at the U of M’s Minneapolis campus tomorrow night. It’s the latest Bell Museum Social, which presents an artist in residence in the context ofthe Bell’s natural history displays. Symptom confused me. I loved it, but it confused me. And then when I went home and read the program, and then read the other program, I was confused even more (yes, there are two programs). An article about our works relationship to space and architecture citing examples 1/2 Life, GO, Holiday House and new work Closer. 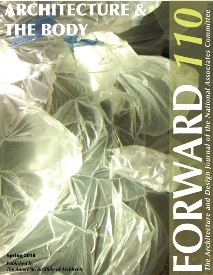 Check out the cover featuring the 1/2 Life installation constructed by Emmett Ramstad. “They crackle with radioactivity, lurch and stagger, break into convulsive silent laughter. It is very rare that a performance piece of any kind causes to me to scribble notes in the margins of my program afterward out of desperation not to forget any of the plethora of amazing images and ideas. A new work by Body Cartography Project uses dance, music and visuals to explore a dystopia world. 1/2 life on 3 minute egg! 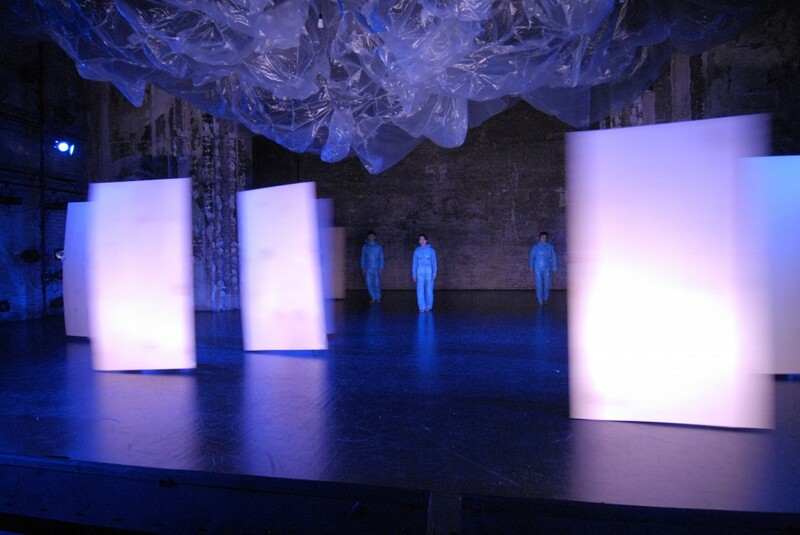 When I think of multidisciplinary performance art, I usually imagine a melding of theater, dance, visual art, and maybe some slides or video projection. 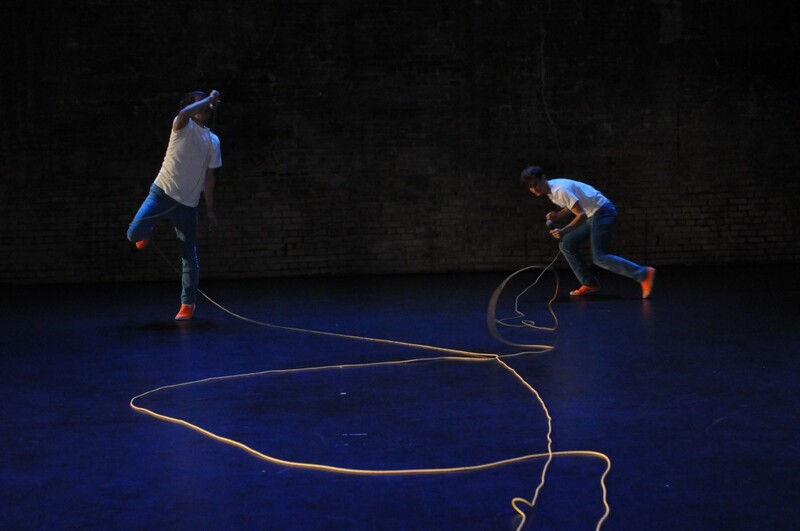 BodyCartography Project’s 1/2 Life, now playing at the Southern Theater, has all that, with one addition: physics. World sojourners Olive Bieringa and Otto Ramstad, aka BodyCartography Project, undertake a new performance piece of global proportions. 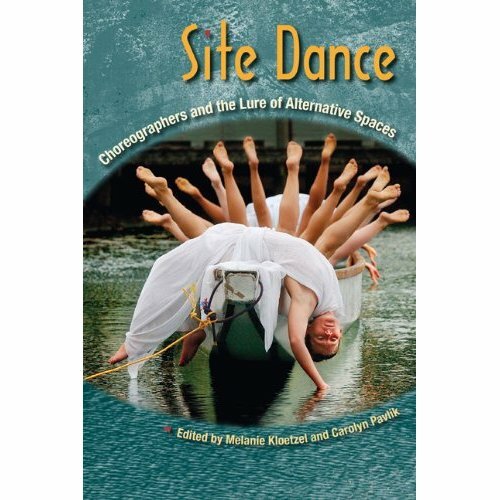 Lightsey Darst reflects on the offerings at this year’s Choreographers’ Eve showcase, curated by BodyCartography Project, and on the lively (often heated) audience conversation online that has followed in its wake. REVIEW: This year’s dance sampler was dedicated to Pina Bausch, Merce Cunningham and Michael Jackson. Curators Olive Bierenga and Otto Ramstad of the BodyCartography Project dedicated Saturday night’s Choreographer’s Evening performances to a trio of late, great dance icons — Pina Bausch, Merce Cunningham and Michael Jackson — and reminders of their legacies, intended or not, were apparent throughout the show at Walker Art Center. “The American dancer and choreographer Otto Ramstad explores the nervous system in an installation with white threads hanging from the ceiling. Nerve fibres, maybe? In Hello Nervous System, Ramstad allows his audience to sense how the nervous system is a meeting point for and affects the whole body.